While Croatia may be considered one of Europe’s hottest destinations, it’s really the Dalmatian Coast where adventure travelers are heading for the greatest of escapes. 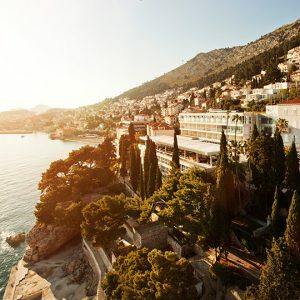 Each island and city in this "new Mediterranean Riviera" tells a different tale, offers its own food and wine, and harbors unique customs, which you’ll soon discover on this Boundless Journeys Dalmatian Coast Hiking and Kayaking tour, rated a "50 Tours of a Lifetime" by National Geographic Traveler. Hike through olive groves, pine forests, and along jagged cliffs, and kayak over crystal clear seas. Learn about Croatia’s rich history, punctuated by medieval battles, and the heroic tales of Jason and the Argonauts. 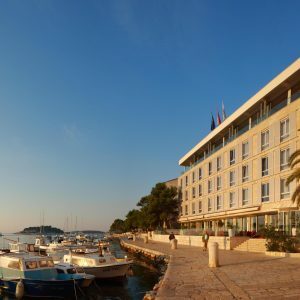 Explore the UNESCO World Heritage Sites of Split, Korcula, and Dubrovnik, and spend three nights in hip Hvar, renowned for its 13th-century walls, marble streets, and nightlife. Enjoy some of Croatia’s finest culinary delights—from olive oil in Split, oysters in Ston, and brandy produced on the Neretva plain—plus home-cooked Dalmatian meals and feasts. And at day’s end, relax in deluxe seaside accommodations and wonder why you didn’t take a Boundless Journeys tour of Croatia sooner. Strolling the cobblestone streets of Dubrovnik, a UNESCO World Heritage Site and "Pearl of the Adriatic"
Going to the forested island of Mljet and hiking through the incredible beauty of Mljet National Park, a place first chronicled in Homer's The Odyssey. One of our favorite trips ever! The first day of our tour begins with a walk through the bustling city of Split, one of the Adriatic's most vibrant ports of call. Through the centuries, it has changed hands between Greeks and Romans, Byzantines, Venetians, and Austrians (among others), but perhaps the city's greatest claim to fame is its enormous, 3rd-century Palace of Diocletian. Created as the Roman emperor's retirement home, the structure is an important example of transitional style, comprising an imperial villa, Hellenistic town, and Roman camp. This afternoon, we enjoy lunch at the Uje Oil Bar in town, where you can dunk your bread in various Croatian olive oils, before boarding a ferry to the island of Hvar. Upon arrival, we visit the charming town of Jelsa, located in central Hvar between the island's two highest mountains, St. Nikola and Hum. Tonight we enjoy a wine tasting at one of Croatia's most well known vintners, Tomic, where the pillared stone cellar is modeled after a Roman dining room and constructed using materials and methods originally employed by Diocletian. At day's end, we retire to our boutique hotel in the town of Hvar, offering panoramic views of the town and the marina. Today begins with a hike from the hamlet of Velo Grablje to Malo Grablje, an abandoned stone village that preserves important examples of Croatian architecture dating from the 9th through the 12th centuries. Later this morning, the downhill trail takes us from rugged canyons to the coast, and the tranquil bay town of Milna. We continue along emerald coves and white pebble beaches laced with the scent of pine trees, on our return to Hvar. This evening, we visit the unspoiled villages of Hvar's northern coast, where we are dinner guests at the historic estate of a local artist. Here we enjoy a homemade meal made from local organic products, and an artist-led studio tour. This morning we take to the Adriatic for a sea-kayaking excursion to the Pakleni Islands, an emerald archipelago just a short distance from the town of Hvar. Here, white-pebble beaches and secluded coves are dotted with Aleppo pines, once an import source for the resin that was used for centuries as a protective coating for the islands' sea-faring galleys. In the afternoon, we return to Hvar for a stroll inside the city's 13th-century walls to its sprawling central square, Trg Svetog Stjepana. Here we enjoy a talk with the island's foremost aromatherapist. As the day wanes, you may choose to make the climb up to Fortress Spanjol, a medieval citadel built to defend the city against the Turks. 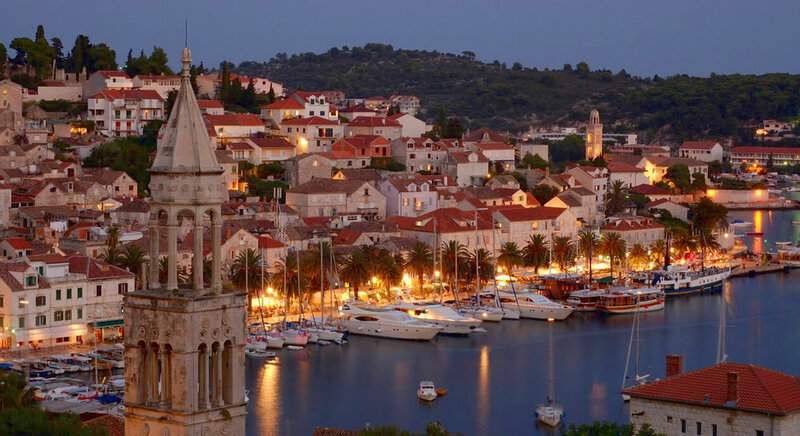 Here the views of Hvar's Old Town and the setting sun are unparalleled. Our fourth day begins with a transfer to Hvar's eastern-most tip, where we board a ferry for the 20-minute voyage back to the mainland. Our first destination this afternoon is the Neretva Plain, an hour's drive inland. 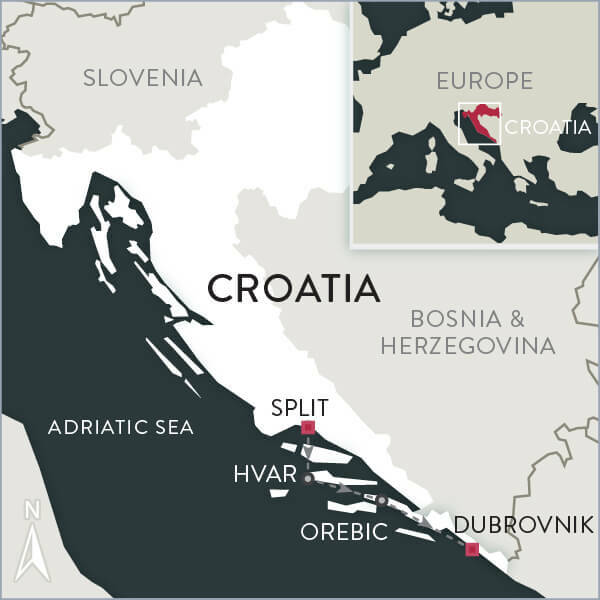 Rolling fields, clear rivers, and the distant outline of the Dinaric Alps are highlights of this region, known as the "Croatian California" for its ability to produce the best selection of citrus fruit in the country. We stop by a local vendor to sample delicacies such as tangerine honey and walnut shnaptz. As we make our way south, we briefly cross the border into Bosnia before returning to Croatia and our destination, the Peljesac Peninsula and the town of Ston. Once in Ston, we take a hike along the village's famous 14th-century stone wall. At more than three miles long (second only in length to China's Great Wall), the impressive structure once housed 14 towers, and was used to protect both the Dubrovnik Republic's western borders and Ston's valuable salt pans, which are still in use today. Our tour today ends in Orebic, a charming resort town where we check in at the beachfront, Hotel Indijan, at the foot of Sveti Ilija Mountain. A contemporary feel pervades this well-designed hotel. Rooms are modern and well equipped, and some have balconies with views over the Adriatic to Korcula. The small circular heated pool has a retractable glass roof, so it’s usable all year round. Hotel Indijan also features a bar, an expanive terrace, a private beach just steps from your room, and a restaurant serving delicious food and local Dingac wine. 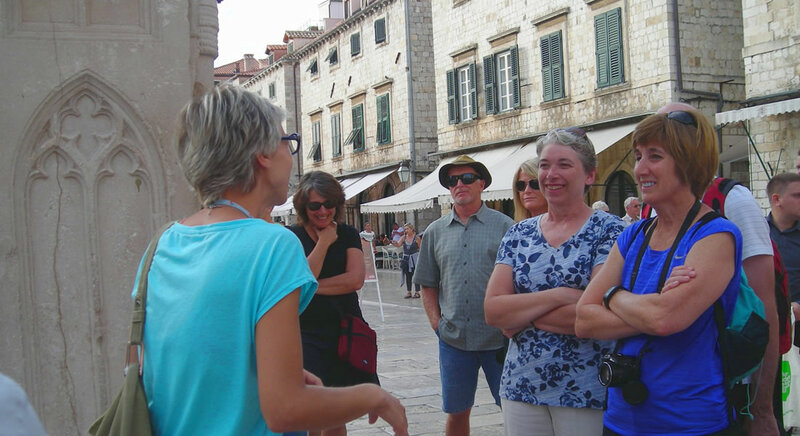 Following breakfast, a short ferry transfer brings us across the channel to the scenic island of Korcula for an educational city tour by a renowned local guide. Korcula town's grid of marble streets and whitewashed buildings are rich in history and architecture, and the island is known as a cultural epicenter where age-old folk music, dancing, and religious ceremonies can still be observed. We break for a few hours of sea kayaking on the crystalline waters around Korcula, where small islands offer a plethora of sunny beach hamlets and hidden lagoons to explore. Back on land, we have an afternoon taste test of some of the Peljesac Peninsula's acclaimed wines, often considered the best in the country. For dinner this evening, we may want to try one of the local konobas—restaurants that originated as fishermen's hangouts, where hardworking seafarers could enjoy their catch as a meal cooked by the restaurant owner. 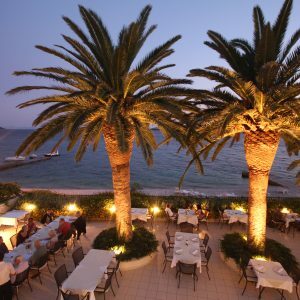 Located in the hills above Peljesac, the konobas showcase regional Dalmatian cuisine such as air-dried ham or pršut, and dishes baked "under the bell"—a traditional method of cooking meat and vegetable dishes in a metal dome buried in glowing embers.This evening's meal is sure to be a savory and sumptuous feast. Today, a private boat brings us to the forested island of Mljet, just east of Korcula. The island's epic beauty was first chronicled in Homer's The Odyssey as the place that captivated Odysseus for seven years. Today, Mljet's northwest half has been preserved as a national park, and we will spend the day hiking along pine-shaded paths to one of the island's unique saltwater lakes. After our adventure, we return by boat to Orebic for the night. This morning's hike takes us to the slopes of nearby Mt. Ilija, the highest mountain on the Peljesac Peninsula. Mt. Ilija offers one of the best vistas in Dalmatia, with views of the surrounding Dinaric Alps, the islands of Korcula, Brac, Hvar, Vis, and Mljet, the Neretva river delta, and even the outline of Mount Orijen in Montenegro. 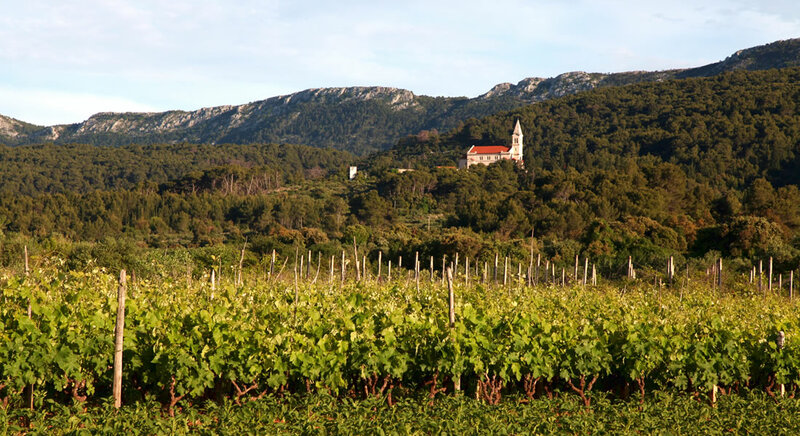 We begin in Orebic, slowly ascending through vineyards, past an old Franciscan monastery, and along the coast to the town of Viganj. Later this afternoon, we make our way to the mainland and Dubrovnik. Known as the "Pearl of the Adriatic," Dubrovnik's walls have protected this vibrant republic for more than five centuries, and many of its historic treasures—from marble streets to Baroque buildings and even a pharmacy that's been in business since the middle ages—survive today. Among Dubrovnik's many highlights are the views from its one-mile walkway around the city walls, the vibrant local scene along its pedestrian-friendly Stradun promenade, and of course, its endless bounty of delicious, fresh-caught seafood. We spend our last celebratory night at a deluxe hotel situated on the beautiful peninsula of Lapad. The hotel's dramatic cliffside location, below the aromatic, pine-covered Petka woods, affords spectacular views in every direction. Featuring direct access to the beach and an outdoor swimming pool with sun loungers, Grand Villa Argentina offers two restaurants and bars with panoramic sea views. The UNESCO-listed Dubrovnik Old Town is just a 5-minute walk away. Combining the old and the new, the property comprises a historic villa and a modern building surrounded by gardens with Mediterranean vegetation. Amenities also include a luxurious spa and fitness center. Today you will be transferred to the Dubrovnik Airport in time for your departing flight, or you may continue to explore the charms of Dubrovnik on your own. Boundless Journeys' trips are designed for energetic and flexible individuals who like to be active and have a spirit of adventure and a positive attitude. 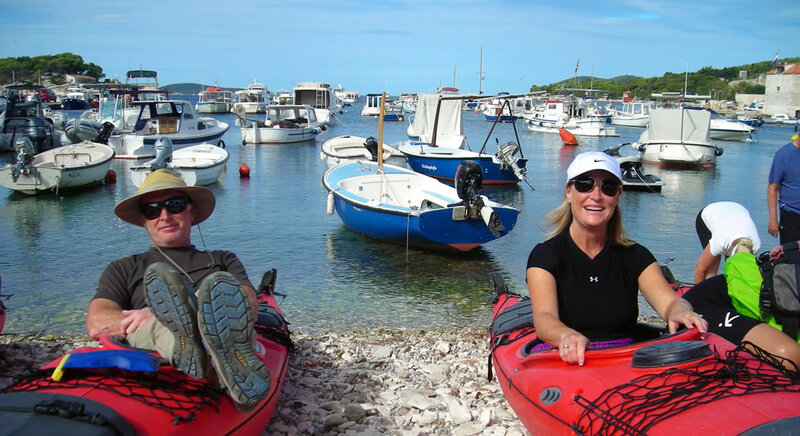 Croatia: Dalmatian Coast Hiking & Kayaking is rated 2, easy to moderate, on a scale of 1-5 (with 5 being the most strenuous). Croatia's calm coastal waters are ideal for sea kayaking, while its island trails offer moderate hikes at elevations ranging from 600 feet to 1,700 feet. This trip is suitable for beginner and expert kayakers alike; no previous experience is necessary. Our hikes range from 1 to 5 hours (2 to 7 miles) on good trails, and our sea kayaking adventures are 2-4 hours in length. 9:00 a.m. on Day 1 in the lobby of your pre-tour hotel, Split, Croatia. Your guide(s) will provide transportation to the Dubrovnik airport (DBV) in time for a 7:00 a.m. departing flight on the final day of the tour. If you are departing later in the day, or extending your time in Dubrovnik, the airport can easily be reached by taxi service. The climate is typically Mediterranean, with hot summers, and short, mild winters. The weather in the beginning and end of the summer, and into the early fall, is usually very pleasant with daytime temperatures in the 70s and 80s, and the 60s at night. While these months are not in Croatia's "rainy season" there can be cool breezes or showers at any time. Please come prepared to walk - rain or shine. We will do daily activities as planned, unless weather conditions make it dangerous to do so. Late spring to early summer and late summer to early fall tend to be the best times to visit Croatia, avoiding both the hottest months and peak tourist season of mid-summer. Mountainous areas can be cool, especially in the evening. A swim in the sea is possible from April to October, with water temperatures increasing throughout the summer months. Traditional Croatian cuisine reflects diverse cultural and geographic influences as a result of access to the sea and fertile farmland, as well as foreign occupiers who imported their flavors and recipes. Croatians are very proud of their gastronomic tradition, and while there are regional differences, you'll find that freshness, grilling, and daily baking are consistent across the country. Until recently, there was little menu variety within the region. But a new breed of chefs has infiltrated Croatia's dining scene with food-forward trends and preparations. This culinary outlook has given new life to Croatia's dining scene, which is now innovative and exciting. Freshness and simplicity are the keywords that most properly characterize Dalmatian cuisine. Main meals typically start with prsut and paski sir (thinly sliced dry-cured ham and sheep milk cheese), often scattered with olives that have different flavors, depending on the Dalmatian village that grows and processes them. Oysters (kamenice) from Ston on the Peljesac Peninsula are also prized, as is anything from the sea. Riba na leso (fish grilled with olive oil) and served with blitva (boiled swiss chard and potatoes) is a common main course, as is skoljke i skampi na buzaru (shellfish and shrimp stew). There are as many recipes and spellings for buzara as there are restaurants, but common ingredients in this sauce seem to be oil, garlic, parsley, wine, and shellfish. Pasticada (larded beef or pork roasted in wine and spices) is another good choice. Vegetarians can easily be accommodated. 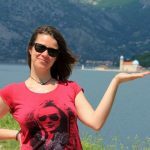 Miha is a seasoned guide with more than 15 years of experience traveling and guiding in the Balkan countries of former Yugoslavia. He is passionate about the cuisine and nature of this region—one of the most culturally, architecturally, and geographically diverse in the world. In his early years as a student of economics, Miha spent his summers on the Mediterranean—Croatia, Greece, Turkey, and Egypt are all second homes to him. 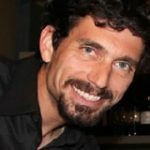 An adventurer by heart, Miha enjoys mountain biking, road cycling, trail running, and trekking, as well as teaching skiing in the Austrian Alps. You can hardly find a better person to show you the Dalmatian islands and amazing coastline. 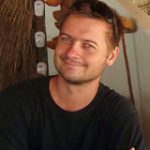 Roman was born in Slovenia, holds graduate degrees in both anthropology and Chinese, and is a knowledgeable and seasoned traveler with more than a decade of experience in tourism. His adventures have taken him through remote jungles and across the high Himalayas. Now back in his native country, Roman has devoted himself to exploring every green corner of the scenic land he calls home, as well as the neighboring Croatia. His friendly disposition and passion for the region’s wine and cuisine make Roman the ideal traveling (and dining) companion for your journey. Hikes range from 1 to 5 hours (4 to 7 miles) on good trails, and our sea kayaking adventures are 2-4 hours in length. This trip is suitable for beginner and expert kayakers alike; no previous experience is necessary.